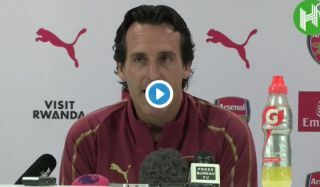 Arsenal manager Unai Emery showed he has a sense of humour today in his press conference as he answered a journalist’s phone. The Gunners boss simply picked up and introduced himself, with whoever was on the other end quickly deciding to hang up. Emery was initially interrupted while addressing a question, but had the whole room of reporters laughing as he took a break to chat to a total stranger. The Spaniard hasn’t had the easiest of starts at Arsenal after replacing Arsene Wenger this summer, but the pressure certainly doesn’t seem to be getting to him!
? "Hello, I am Unai Emery"
The @Arsenal boss brilliantly answers a journalist's phone during his press conference.